In the early decades of the twentieth century, a German sociologist, Max Weber, among few scholars, initiated thinking on the development of efficient systems for organizational administration. He developed the basic principles of Bureaucracy which surrounded on position, authority, performance, social standing (personal contacts), role clarity, task responsibilities, hierarchy, rules, standard operating systems, procedures, norms, behaviour etc. More or less during the same timeline (1916), Henry Fayol (the CEO of Comambault Mining), a French mining engineer, identified 14 Principles of Management for general administration. As Weber's principles, these principles also provided a general guide for work efficiency and called for developing proper systems in order to manage the resources of an organisation more efficiently. In the literature on management primarily this was the beginning point when general administration was discussed at such a length and both academia as well as the practitioners were realising the importance of systems and structure for office work-flow. Hundred years down the line, the principles of work behaviour for efficient use of resources are reiterated in changing business environment. The relationship between boss and subordinates, management and employees, business and society has been under scan in last 30-40 years and there is evidence that it is very difficult to find a universal approach and timeless practice which can lead to best possible results as outcome from the workforce. In these times a book by Utkarsh Rai on looking at the prevalent myths at the workplace as against the realities make a strong case for its practice and follow up. The author successfully draws 101 myths and counters them with the realities and provides prescriptions for management as well as the employee to get prepared and to get away with the general thinking which is in many cases wrongly perceived and placed. The book covers almost all parts of the general principles of management starting with promotion and taking along other intrinsic and extrinsic factors of work, like salary, career, working relationship, colleagues, subordinates, appraisal etc. The foreword written by Nandan Nilekani and the praise by Kiran Majumdar Shaw and Som Mittal positions the book before its readers with conviction and clarity. This might initially be a strategic decision of the author, however after reading the book I too felt attached to their views on appreciating the author for clearly explaining the myths and posing it with the prevalent reality and the way as to how to face it. The style of its presentation is simple and very much reader friendly as it is positioned as a guide for all employees at different levels of management. I get reminded of the management challenges that Peter Drucker [Management Challenges in the 21st Century, 1999, Butterworth-Heinemann, USA] talked about in his book through assumptions and realities whether on the role of management, or the approaches to deal with employees. The simple language of the book through the practical examples and day-to-day events make it engrossing, relevant and convincing. It is written in a format which suits self-help books but is packaged quite differently as one can jump from one myth to another one very easily without being caught in missing the continuity. The conversations at the office cafeterias could be observed and one can easily find the scenarios wherein the book fits well and provides a simple prescription as to how to deal with the situation at hand whether you are an employee or a manager. The prescriptions are more suggestive in nature and the perspective is very positive which come very handy while one encounters a dilemma as to how to deal in such a situation. As I was reading through the book and looking at the myths and realities I often got reminded of a concerned theory from management, leadership, or/and motivation literature. Though the book does not really cite any theory but it is quite aptly seem to be applied which looks coincidental. This is where and how theories and practice bridge the gap and this is what for I like this book. I wished some more myths in the categories of work-life balance, stress, time management, organizational conflict, mindset mapping, challenges, training and learning, etc. Though in most of the cases both the perspective have been taken, however at some places, e.g., Myth - communicating in the native language will help the project, Reality – it might hinder team relationships for those who do not understand the language, (p 256) the prescription for employee is missing which could have been done. The work experience of the author is well reflected all through the book at different levels of management and certain practices of an ideal versus practical life are nicely related and juxtaposed in the text of the book which even a layman can follow. Just to mention an example of this is myth - my colleague is my best friend, as against the reality: the real check of friendship is when one is promoted over other. This is so practical that one faces it day in and day out at the workplace. Such myths make the book practical as one relates with the book and finds oneself in one or the other myth. After going through all the myths and realities one tends to discover the dominance of the great power of soft skills over the technical knowledge of one’s specialisation or one’s core area. In most of the cases I found that the role of interpersonal relationship is dominating and having a clear conscience with positive bent of mind solves almost all the problems that one faces at the work place. The organizational priorities, manager’s choice (based on logic and rationale and not favouritism), employee’s attitude and aspirations, social pressure, etc are elaborated through the myths and realities which make the book rich, reflective and reiterative at many places. The author deserves all the kudos for this effort. Though much has been written on principles of management in the last century, many have researched the 14 principles from the angle of their applicability in the present context [e.g. Rodrigues (2001) Fayol’s 14 Principles of Management then and now: a framework for managing today’s organizations effectively, Management Decision, 39(10) 880-889], many have questioned timelessness of those principles, yet those principles find their relevance as they are the academic reference points in the management literature. 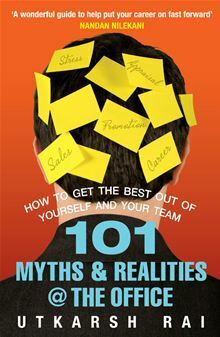 This book provides a practical outlook to the theoretical principles in the modern day organizations and suggests a well charted path for how to get best out of yourself and your team. For employees of today this book provides a hope for tomorrow.